In contrast to earlier statements, the FBI now says it found documents dealing with the tarmac meeting at the Phoenix Sky Harbor International Airport between former Attorney General Loretta Lynch and former President Bill Clinton. The meeting on a private jet on the tarmac was held at the height of the 2016 presidential race while then-candidate Hillary Clinton was being investigated by the FBI over her private email server and raised serious questions about the integrity of the government probe. 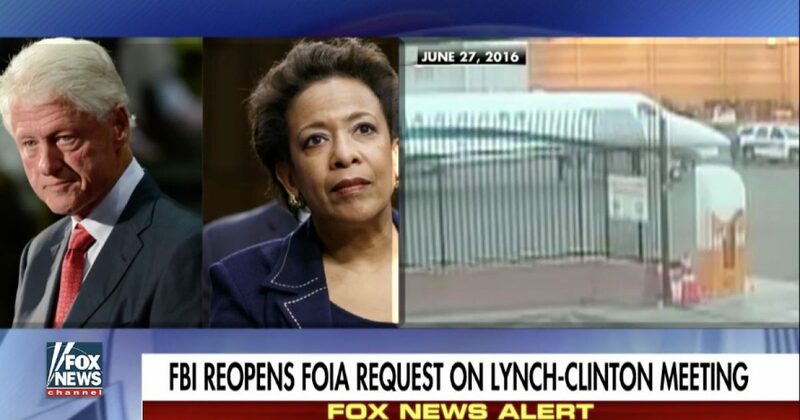 Judicial Watch originally filed a FOIA request in July 2016 — which the Justice Department did not comply with — seeking “all records of communications between any agent, employee, or representative” of the FBI for the investigation into Hillary Clinton’s private email server use, and all records related to the June 27, 2016 meeting between Lynch and Bill Clinton. Loretta Lynch is scheduled to meet with Congressional Committees soon with regard to the efforts by Russia to influence the 2016 presidential contest.